You can choose where you want to be notified once the rule has been triggered. In our example we’ve picked marketing channel in Slack, so that the whole marketing gets the alert when something is up. Here you pick your Facebook ad account that you set your rules for. Note: You can connect your Facebook account to Revealbot and then pick what ad accounts you want to connect to Revealbot. This is the section where you define what exact instances you apply your rules to, whether it’s all campaigns, certain adsets from different campaigns or a specific ad. If you choose campaigns, Revealbot would apply to all the campaigns that you pick. If you pick advert sets, your rules would be applied on an ad set level, so if you select a campaign, the rule would be applied to all ad sets in that campaign. The same logic applies to ads. If you click Apply to all, the rule will be applied to all the items on campaign, advert set or ad level that you picked. After defining the level, you can pick specific campaigns, advert sets or ads. Note: you can choose ad s from multiple advert sets, i.e. pick a couple from one advert set, then go to another adset and pick ads there. Here you define conditions that would tigger alerts. You can have multiple conditions in your alert rule and you can define whether you need all of them to be met in order for the rule to be triggered or at least one of them. That’s why you either choose “All conditions match” or “Any condition matches”. In the first dropdown you pick the metric, next you set its condition. Say Cost Per Purchase is greater than $50. By clicking Add Condition you can define another condition, e.g. Spend > $500. Below we see the hint translating our rules into human language: Alert if Cost Per Purchase is greater than $50 and if Spend is more than $500. After hitting Submit, your Alert rule would be created and you'll see it on the Rules page. Don't forget to check out Automation. 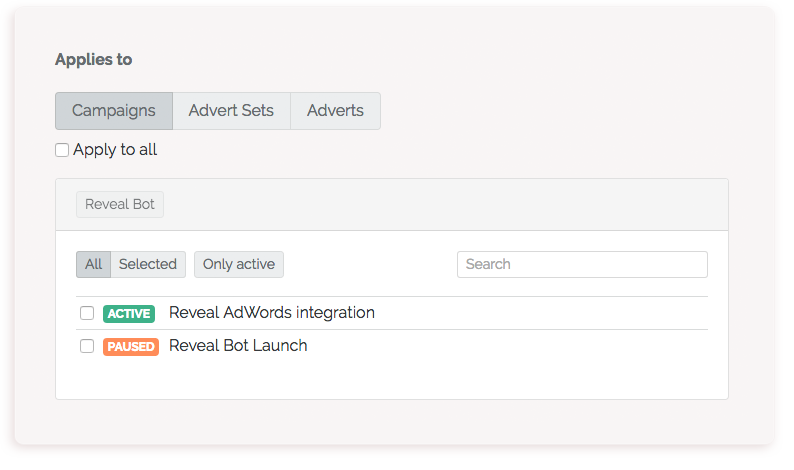 With automation, Revealbot would manage your ads for you based on the rules you set.